What Went Down At The Big White House Legalization Rally? Hundreds of cannabis supporters gather for a rally on Saturday in front of the White House to hold a “smoke-out”. As marijuana legalization continues to be a hot issue for the United States government, hundreds of cannabis advocates gathered in the nation’s capital, Washington D.C., on Saturday to hold a “smoke-out.” Demonstrators believe their efforts will help to persuade President Barack Obama to legalize marijuana on a federal level. The federal government continues to list cannabis as a dangerous, addictive drug, despite facts and scientific research supporting the contrary. With some states, and even D.C. itself, allowing for recreational and medical use of marijuana, activists decided enough was enough, and organized a rally to have their voices heard. 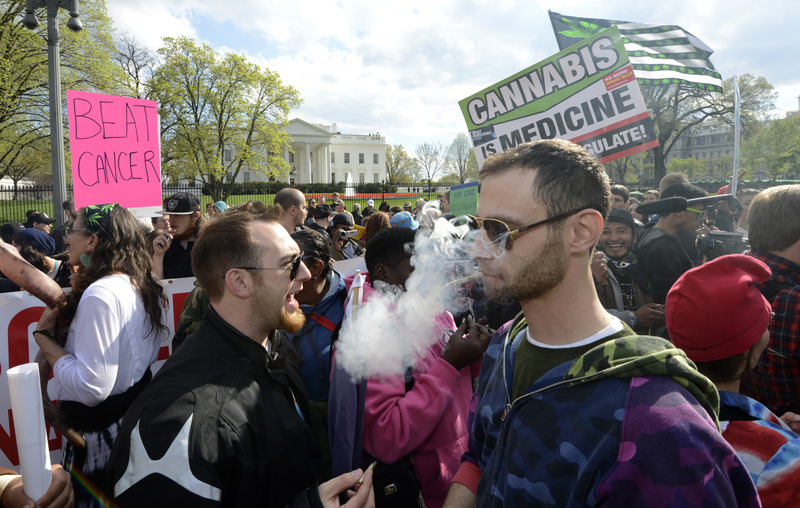 On Saturday, at 4:20 p.m., over 200 ganja-toting protesters stood in front of the White House and sparked up. Headed by local organization, DCMJ, which fights for the decriminalization of cannabis and equal treatment for users, the group stood peacefully, puffing their bowls and vaporizers. Onlookers gawked in amazement at the hundreds of smokers openly defying federal laws. While federal regulations and the Drug Enforcement Administration (DEA) might still list marijuana as a Schedule 1 drug, deeming it dangerous and addictive, the local government of Washington, D.C. has legalized recreational and medical cannabis use; creating what quite possibly might be the largest contradiction in the history of our great nation. The group carried a specially made, 51-foot, inflatable joint that read, “OBAMA, DESCHEDULE CANNABIS NOW!” Many advocates consider President Obama to be a hypocrite, due to the common-knowledge of his history with cannabis use, but the President has vowed to do everything in his power to ensure some form of legalization, or at the very least decriminalization, before leaving office. When police refused to let protesters carry the spectacular spliff into Lafayette Park, Adam Eidinger, co-found of DCMJ, and other members came up with a plan of action; the joint was quickly deflated and smuggled past security. As a Schedule 1 drug, cannabis is listed among heroine, mescaline and bath salts, some of the most volatile and chemically-formed substances on the market. The listing also stipulates that the drugs have no medicinal value and they cannot be prescribed for usage to treat any illness. Many medical marijuana patients attended the rally, showing their support for the herb that helped when no prescription pill could. Despite the DEA and the federal government continuing to barricade the passing of many legalization bills, advocates believe their ongoing efforts are making some headway. While recreational use of cannabis is legal in D.C., public usage is not. Throughout the peaceful protest, only two citations were issued for public consumption, carrying a $25 fine. One of the tickets was issued to Lauren Dove, who admits she was using more openly than other participants, most of whom tried to remain discrete. With public support growing for the legalization of marijuana, and the proposed support of President Obama, it seems only a matter of time until cannabis is recognized by the federal government as a valuable resource and made legal. Do you think the Washington D.C. rally will help to legalize marijuana on a federal level? Let us know on social media or in the comment below.